She’s back! Back and baking with dark chocolate, of course! There’s nothing like a special occasion to get the creative juices following. We had a quite worldly and very awesome dinner guest Friday night so I decided to test my hand at an international dinner menu! I made Bulgarian Kafka, Israeli Salad, tzatziki, and Lava cakes! Guess which one we’re going to see below? Hint: there’s not cumin or dill in this recipe! The idea for the lava cakes was really external. I was searching for something DIFFERENT than cupcakes, but that could be served individually. I know, I’ve been the cupcake queen as of late! 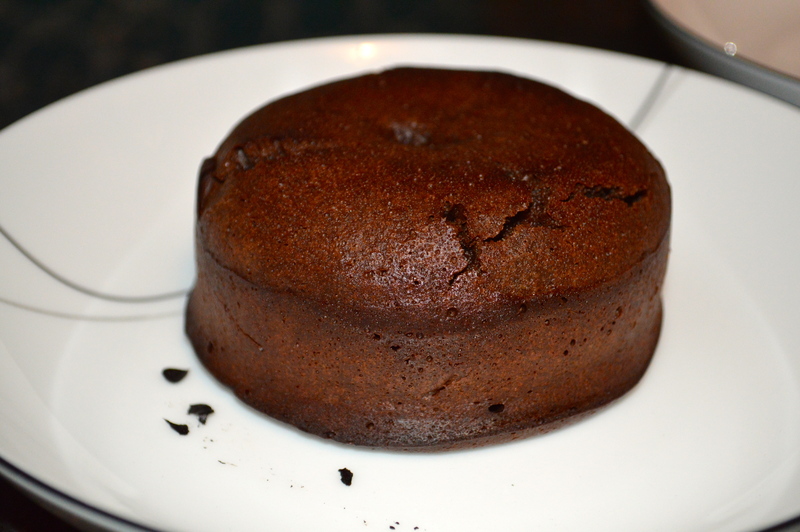 Kyle actually suggested making lava cakes, and it was as if a lightbulb went off – a perfect fit! While searching for a good recipe, I learned a bit about these little chocolate bites of heaven, they’re French! Which is why, you’ll see below, the main ingredients are butter and chocolate. Channeling my inner Julia Child this weekend! Using a “double boiler” aka big and little pans to melt chocolate and butter! I found the “tested in our kitchen” recipe from Food and Wine. I love starting off with recipes that are soundly concocted; it’s always scary when trying new recipes, especially when you find it on the internet. Anyways, I felt positive about using this recipe, so I switched it up and used a nice and rich dark chocolate, and also gluttonously made 3 rather than 4 cakes. The recipe was phenomenal. In hindsight, they could have used slightly less oven time for a more volcanic center, but the middle was definitely lava-like. Creamy chocolate and melted butter! The recipe was shockingly simple. Melt the chocolate and butter, mix in with flour into egg mixture. Put in pans. One would venture there was significantly more involvement based on the 35 minute requirement of you-must-order-ahead-of-your-dinner-if-you-want-lava-cake-for-dessert we find at most restaurants. Well guess what? It was FREAKING EASY! So there’s blowing that out of the water. I even made the batter ahead of time and let it sit for about an hour @ room temperature before baking. Most nerve-wracking moments, waiting for the flip. The recipe calls for flouring the ramekin dishes, but I did the parchment paper trick instead. As I was handling them before the flip/reveal, my heart was beating out of my chest. Not only was I excited about the prospect of gooey chocolate perfectly encased in a doughy chocolate shell, but Kyle and my uncle were STANDING IN THE KITCHEN WATCHING ME as I was about to turn them over. Intimidating stuff, especially if I’m used to my own critical eye, not 2 other pairs as well! Naturally I paired rich chocolate with a creamy vanilla ice cream. I added the berries to brighten up the flavors as well, made it slightly less heavy. Strawberries would have worked just as well! I’m sitting here thinking about eating this the other night and my stomach is churning. Both with nostalgia and regret; it was beyond fantastic but remembering that I essentially made everyone eat 1 1/3 servings of lava cake isn’t comforting. But, mmmm memories, decadent memories. Brain-storming trying my hand at something unexpected, I know I have said that in the past, but I am optimistic about it this time :D! Preheat the oven to 450°. Grease and line four 6-ounce ramekins with parchment paper. Set on a baking sheet. 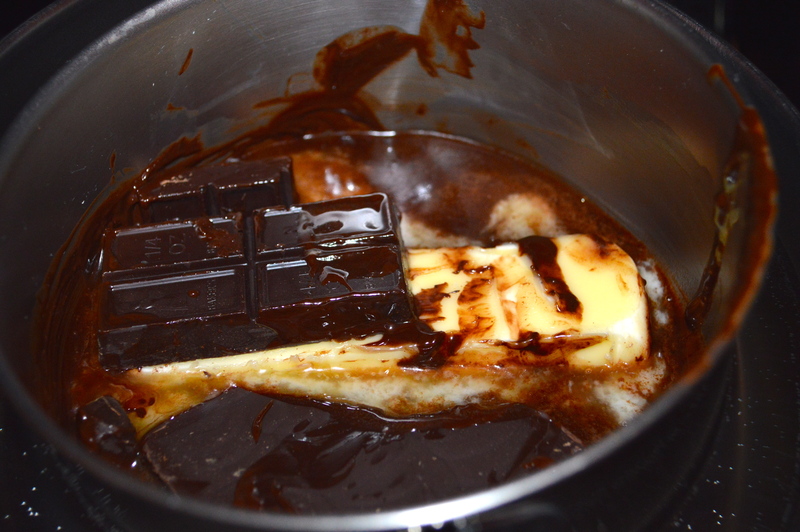 In a double boiler, melt the butter and the chocolate. In a medium bowl, beat the eggs with the egg yolks, sugar and salt at high speed until thickened and pale. 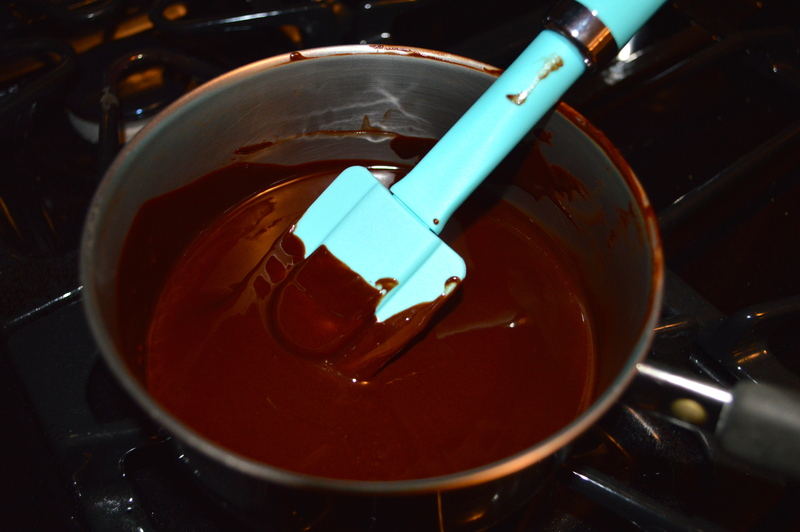 Whisk the chocolate until smooth. Fold it into the egg mixture along with the flour. 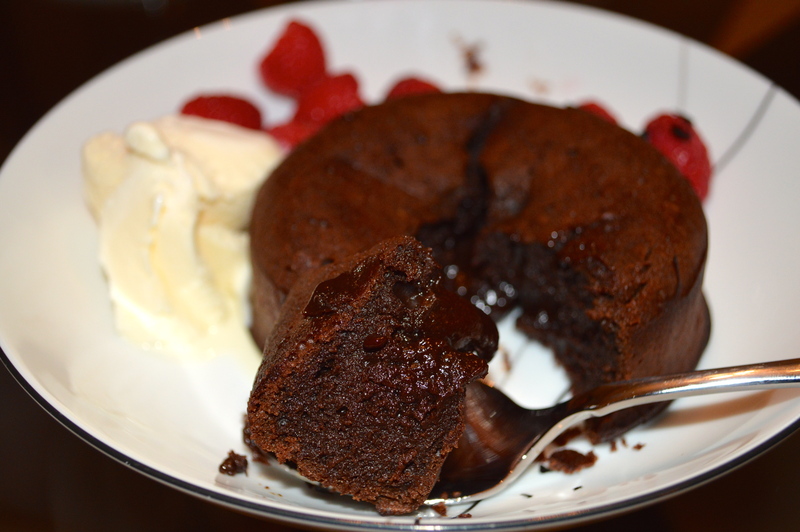 Spoon batter into ramekins and bake for 12 minutes, or until the sides of the cakes are firm but the centers are soft. 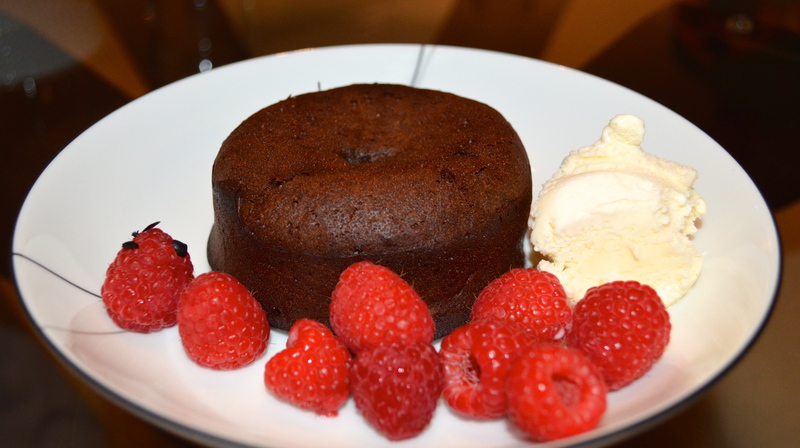 Let the cakes cool in the ramekins for 1 minute, then cover each with an inverted dessert plate. Carefully turn each one over, let stand for 10 seconds and then unmold. Serve immediately! Yum the presentation is nicely done, love it! ← Dusting Off My Baking Pans!